Phew. 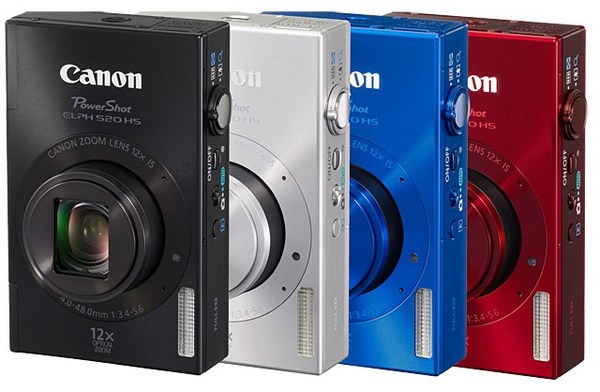 Compared to Fuji's product diarrhoea, Canon has released just two more cameras from its popular ELPH/IXUS line. The one above, is the Powershot ELPH 520 HS, or IXUS 500 HS in Europe and parts of Asia. The camera boasts a 10 megapixel CMOS sensor, an optically stabilised lens with a huge (for a compact) 12x 28-336mm equivalent f/3.4-5.6 zoom lens, a 3" HVGA LCD, and 1080p videos at 24 FPS. Like all HS cameras, it is capable of some high speed stuff, which in this case results in a 6.8 FPS frame rate in continuous shooting mode at a reduced resolution, and the requisite 240 FPS videos at QVGA resolution. The camera is really tiny; it is a fraction larger than the very small Pentax Optio S5n I had in 2005, and that only had a 3x zoom lens. Something had to give, and the result is a compact camera that uses microSDHC cards instead of the usual SDHC cards. The camera will ship in March 2012 at US$300. The Powershot ELPH 110 HS, or IXUS 125 HS, has a 16 megapixel CMOS sensor. an optically stabilised 5x 24-120mm equivalent f/2.7-5.8 zoom lens, a 3" HVGA LCD, and 1080p vidoes at 24 FPS. Similar to its sibling, it offers a continuous mode of 5.8 frames per second at a reduced resolution, and the same 240 FPS videos at QVGA resolution. The camera will ship in February for US$250. Both cameras have some new automated features for casual shooters, so check out the source link for more, along with more photos of both cameras!